Still, the Z Ultra packs a 3,050mAh battery, which is quite a feat – all that at a respectable thinness. The Xperia Z Ultra immediately jumped to second place in our 3G call test, lasting about 24 and a half hours. Only the Huawei Ascend Mate with a 4,050mAh battery beat it, while the Galaxy Mega 6.3 with a 3,200mAh battery is over four hours behind. Granted those three are 6+ inch phablets, not the most comfortable for putting up to your ear, but the Z Ultra will provide hours and hours of call time over several days with a wired or wireless earpiece. 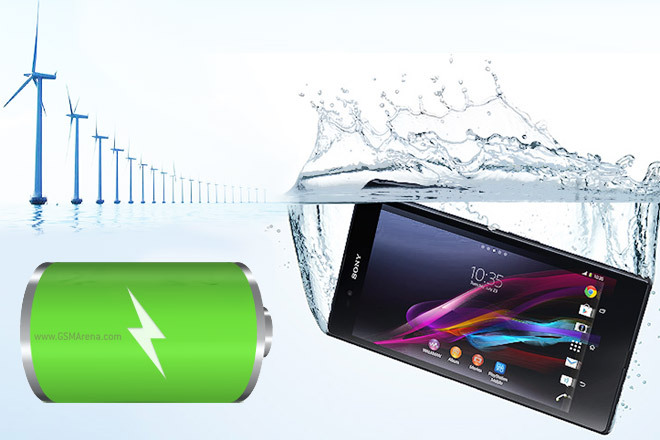 After a spectacular start, the Xperia Z Ultra tumbles and falls hard – when we set it on the web browser test, its battery went flat not long after passing the 5 hour mark. The Galaxy Mega 6.3 and Ascend Mate are at each other’s throats, clocking in 8 hours and 17 minutes dead each. That’s not a terrible result, but browsing the Web would probably be primary use of the Z Ultra so we are less than impressed. But that’s the cost of powering such as big screen. The video playback test was kinder to the Z Ultra’s battery and it actually beat the Galaxy Mega 6.3, but it’s still three and a half hours behind the Ascend Mate and small tablets like the Apple iPad mini. 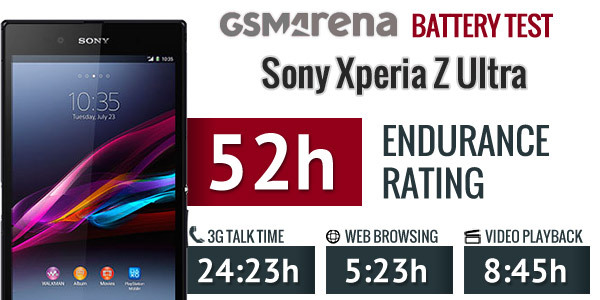 Overall, the Sony Xperia Z Ultra scored a decent endurance rating of 52 hours. That’s the amount of time you should expect the phablet to last on a single charge given you use it for one hour of talking, one hour of web browsing and one hour of video playback per day and leaving the phone in standby for the rest of the time. The good overall ranking aside, its performance was a bit disappointing in what we consider the key tests here – the whole point of having a huge, sharp screen is to browse the Web with tablet-like ease and have that big screen always available for watching some video on long commutes, but it’s those two activities that run the battery dry very quickly. With light usage, you’ll get two days of usage out of the Xperia Z Ultra, but daily charging will probably be more common. You just can’t rely on the Z Ultra for web browsing on the go (especially if you use LTE instead of Wi-Fi). You’ll be able to squeeze in a couple of movies before the battery gets too low for comfort, but the Sony Xperia Z Ultra just isn’t the ideal tool for road warriors that it could have been. It fares much better at home where you can plug it in when the battery drops or just use it as a secondary device that isn’t mission critical.